Infinite Spirit! Impossible to destroy! Last year’s war between Israel and Hamas killed an estimated 2’205 Palestinians and 71 Israelis. Reconstruction is only just getting underway of the estimated 18’000 housing units in Gaza that were destroyed or severely damaged during the 50-day conflict. One of the big mysteries of life! You can kill and destroy as much as you want but Spirit lives on! The human Spirit and hope is alive and thrives. Here’s proof of that. Don’t you ever wonder how some people can survive the worst of atrocities done unto them and they still survive, not only that, but hope and create beauty to boot? I am always in awe of the human spirit! Here’s an article crossed my desk this morning about a colourful neighbourhood in the middle of Gaza Strip. The injustice, horrors, indignities and humiliation that these people have to suffer on a daily basis and still…… Read the article and watch the videos. 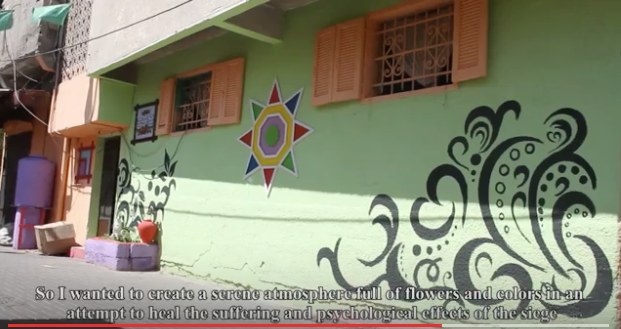 In a video from the Institute for Middle East Understanding, an American non profit org that aims to increase the public’s awareness of Palestinians, Saedi, a Palestinian artist, explains just how his vision for an environment filled with beauty came to spread. So far 30 homes in the neighbourhood have been painted, much to the delight of Al Zaytoon’s younger residents. They call it Al Zaytoon neighbourhood. Zaytoon is the arabic word for olives. Gaza Strip Their olive farms, their livelihood, that have been taken from them by force by the Israelis driving them out of their homes of many generations. These Palestinians have no army no navy and no air force so how can it be called a war? It’s like David and Goliath. Goliath has stepped in, massacred destroyed occupied and taken what they ever want regardless and exercises an apartheid regime to boot, to trample some more on the weaker. Let’s just say it how it is. No matter on which side your sympathies lie you have to see this injustice for what it is. How can we find peace in our world if these things continue based on pure ugly hate. What leaves me speechless is the very fact that nobody ever mentions. The Israelis say nothing about what the Germans did to them, all their hate about the holocaust has shifted to the Arabs. Are they too scared of the Germans and they don’t dare, so they vent their hate against the weaker and now do the same unto the Palestinians? Or is this subject taboo? Not to mention so many other just as bad atrocities that people have suffered all over the world that have been forgotten and are never mentioned. This entry was posted in activists, Aquarian Age, balance, children, cleanliness, consciousness, cosmic laws, dream, Education, empowerment, energy, enlightenment, goodness, goodwill, harmony, health, heart consciousness, human rights, hygiene, intelligence, justice, peace, Youth on 09/08/2015 by mkirtikarphd.